Someone asked me the other day if I could name a movie that was entirely devoid of clichés. 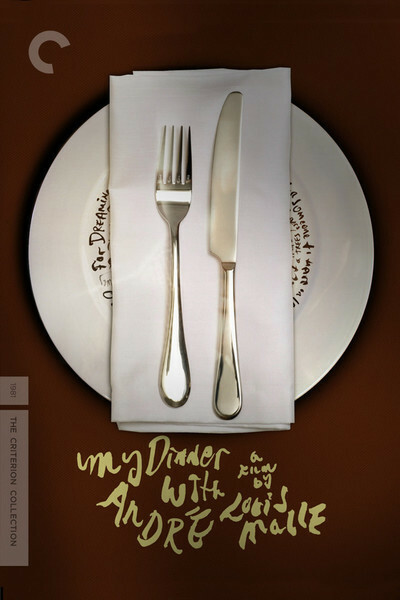 I thought for a moment, and then answered, “My Dinner With Andre.” Now I have seen the movie again; a restored print is going into release around the country, and I am impressed once more by how wonderfully odd this movie is, how there is nothing else like it. It should be unwatchable, and yet those who love it return time and again, enchanted. Wally and Andre meet, sit down, talk for almost two hours. As in all conversations, the tide of energy flows back and forth, but mostly it is Andre doing the talking, and Wally the listening. Wally is a man who likes to wrap himself in cozy domesticity. He is round, earnest, squinting; the character he played in “Manhattan” was described by Woody Allen as a “homunculus”--one of those little men in bottles in the laboratory of Dr. Praetorious. His father, William, was for many years the editor of the New Yorker. “When I was young and rich,” he says, “all I thought about was art and music. Now I'm 36, and all I think about is money.” His friend Andre is tall, thin, angular. He has returned from far-off lands with strange tales, which he relates with twinkling eagerness. Wally's response to this is exasperation. What he basically wants from his life, he says, is to write his plays, pay his bills and enjoy that nice hot cup of coffee in the morning, with the Times delivered right to his door. He likes simple pleasures: having dinner with his girlfriend Debbie. Sleeping under an electric blanket. Reading the autobiography of Charlton Heston. Near the end of the film, he launches into an impassioned defense of the scientific method. While superstition might have seemed reasonable in ignorant centuries, he argues, he is no longer prepared to believe that a fortune cookie contains his fortune, or that “omens” have anything at all to do with whether an airplane will successfully complete its flight. Andre doesn't really question the scientific method. He simply doesn't find it helpful. At a time when men are starving for new visions and ideas, he feels, the quest for transcendence is important even if there is, in fact, no transcendence to be found. On and on the two friends talk, while a spectral waiter with a facial tic (Jean Lenauer) serves their dinner like the ghost at Macbeth's banquet. I saw “My Dinner With Andre” at its first public screening, at the 1981 Telluride Film Festival. During the standing ovation, I found that the two men seated directly behind me were Gregory and Shawn. Few people knew who they were when they entered the theater. Now they would never be forgotten where films were taken seriously. The story of their film is one of serendipity. How as the two old friends talked they began to see how their conversation might be shaped into a play--or perhaps a film. How Louis Malle (1932-1995), the gifted French director (“Lacombe, Lucien,” “Pretty Baby,” “Atlantic City,” “Au Revoir, les Enfants”) signed on, and devised the understated but sophisticated shooting style, in which the distance from the camera to the actors at key moments is calculated to the millimeter, while half-seen reflections in mirrors create the illusion of a real restaurant, and the rhythm of the reaction shots subtly reflects the buried tension between the two men. How the film opened in New York, faltered, almost closed, and then gathered helpful reviews and went on to run for more than a year in that theater and--despite its challenging style--in 900 others. Gene Siskel and I did a question-and-answer session with Gregory and Shawn after the first anniversary screening of the film's New York run. What I remember best from that night is that the two men, asked what they might do differently a second time around, said they would switch roles--”so that no one would think we were playing ourselves.” Are they playing themselves? Perhaps not, but I think they're playing their own personalities. The people they seem to be on the screen are the same people they seem to be in life (“whatever that means,” Andre might say). In another sense, they are simply carriers for a thrilling drama--a film with more action than “Raiders of the Lost Ark.” What “My Dinner With Andre” exploits is the well-known ability of the mind to picture a story as it is being told. Both Shawn and Gregory are born storytellers, and as they talk we see their faces, but we picture much more: Andre being buried alive, and a monk lifting himself by his fingertips, and fauns cavorting in a forest. And Wally trudging around to agents with his plays, and happily having dinner with Debbie, and, yes, enjoying Heston's autobiography. We see all of these things so vividly that “My Dinner With Andre” never, ever, becomes a static series of two shots and closeups, but seems only precariously anchored to that restaurant, and in imminent danger of hurtling itself to the top of Everest (where, Wally stubbornly argues, it is simply not necessary to go to find the truth). What they actually say is not really the point, I think. I made a lot of notes about Andre's theories and Wally's doubts, but this is not a logical process, it is a conversation, in which the real subject is the tone, the mood, the energy. Here are two friends who have each found a way to live successfully. Each is urging the other to wake up and smell the coffee. The difference is that, in Wally's case, it's real coffee.